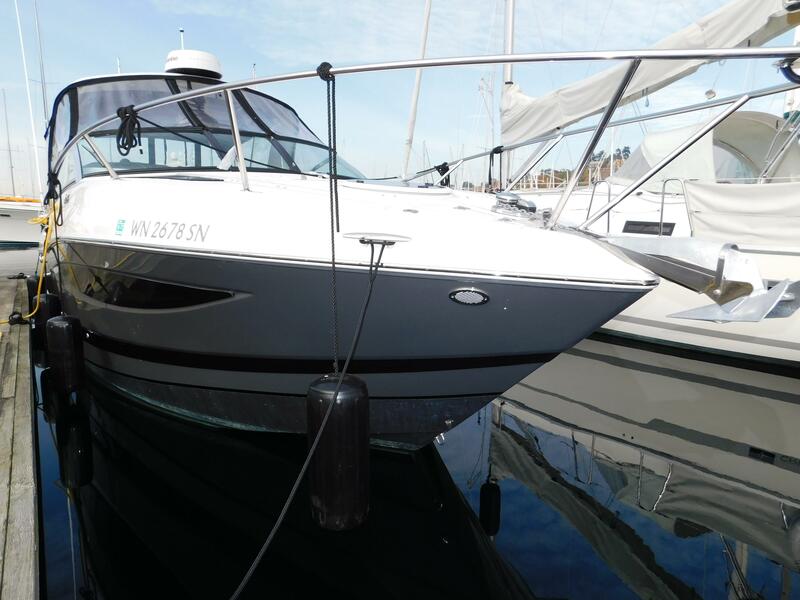 For more information on this yacht, please contact us. 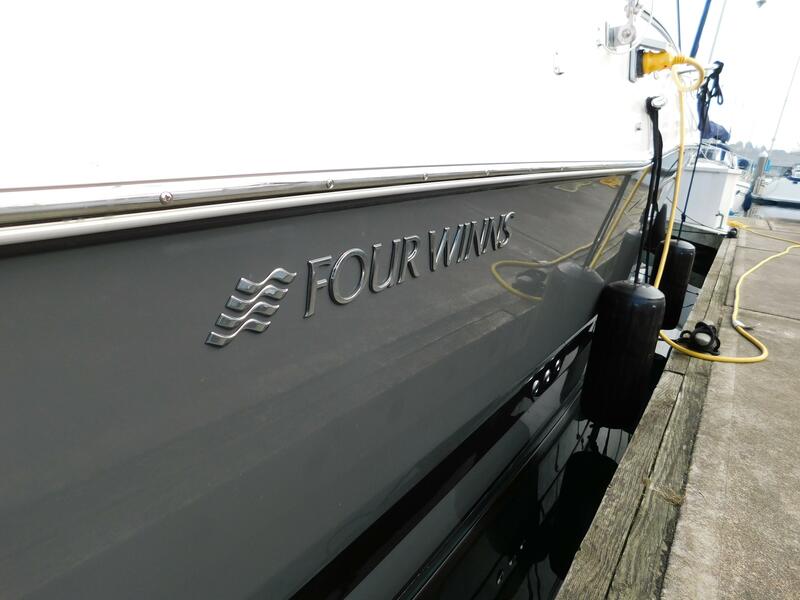 New Listing - 2018 Four Winns V275 with only 47hrs! In new condition and tens of thousands less than original purchase price! Loaded with factory options and ready to go! Previous owner traded for larger boat. 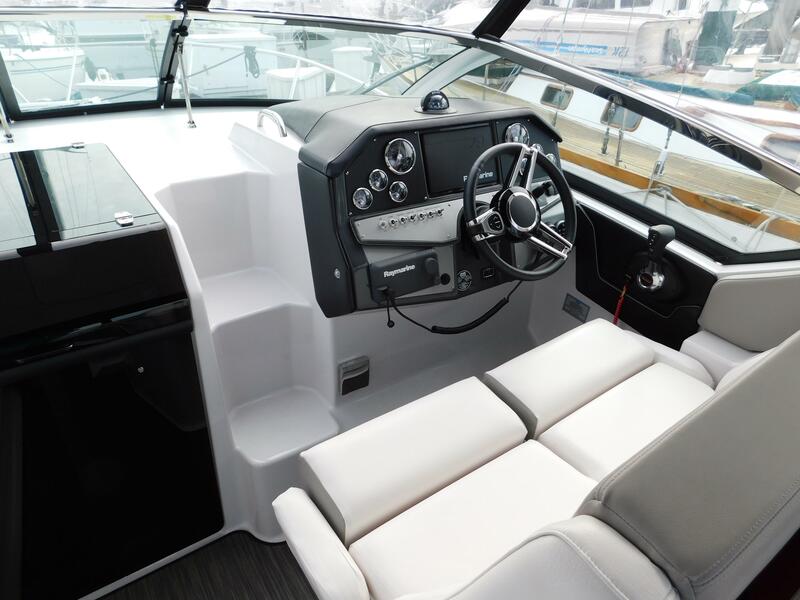 The Vista 275 is a 28-foot express cruiser with finesse and luxury to spare. 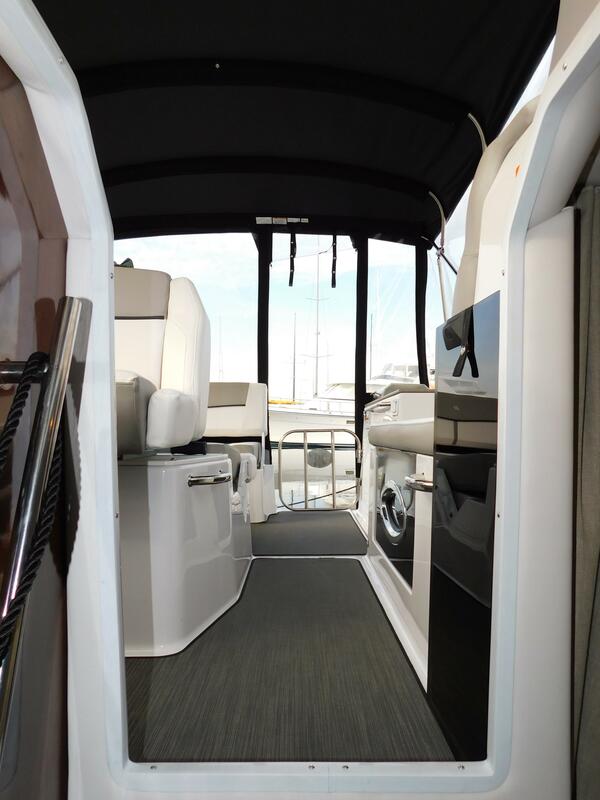 The V275 has features that make it a comfortable cruising vessel and entertaining with it's cockpit galley, large lounge with dinette, and bench seating that converts to a sun lounge. 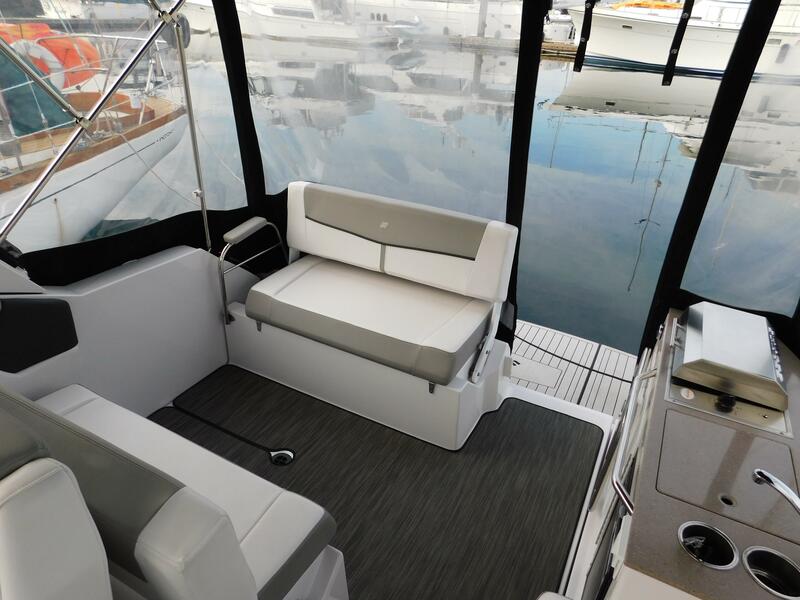 Below the V275 has full accommodations for the family and friends. The helm and cockpit have a full enclosure for all year use. 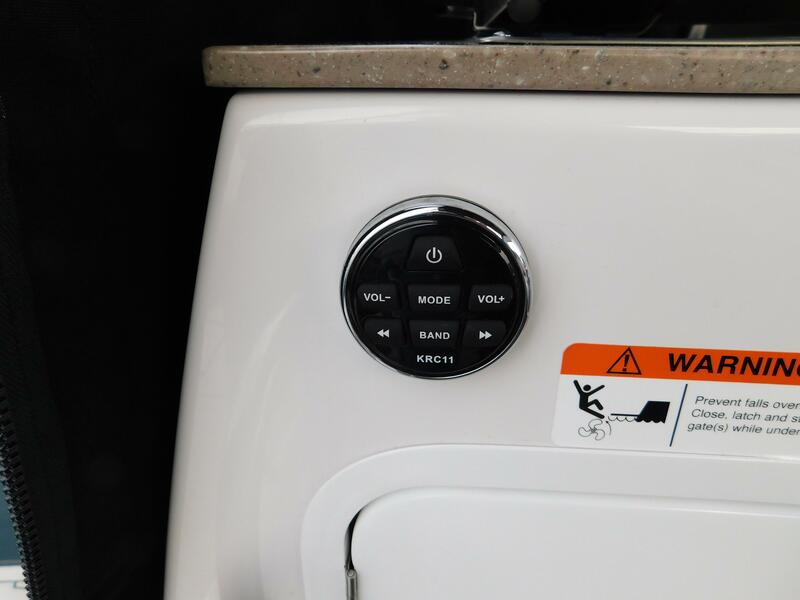 Generator and AC/reverse cycle heat will keep you comfortable in any weather. 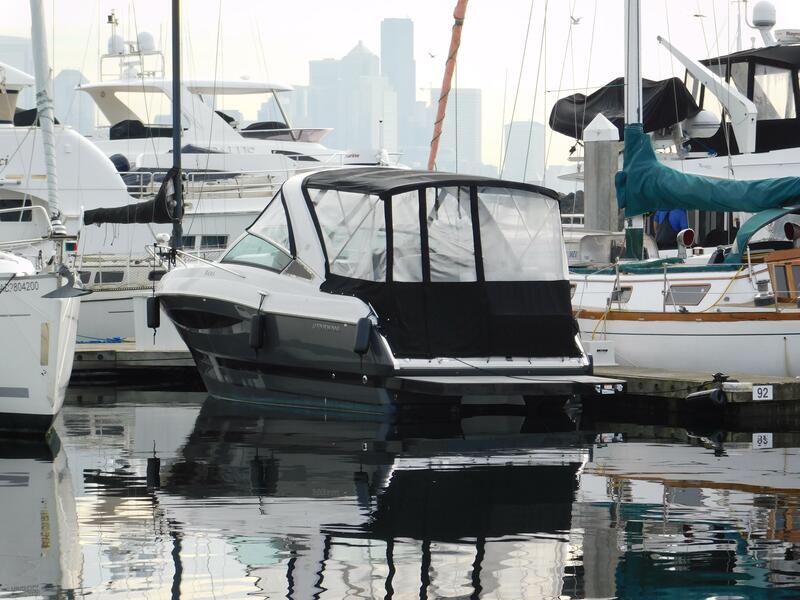 Ease to bring into your boat slip with it's bow thruster. 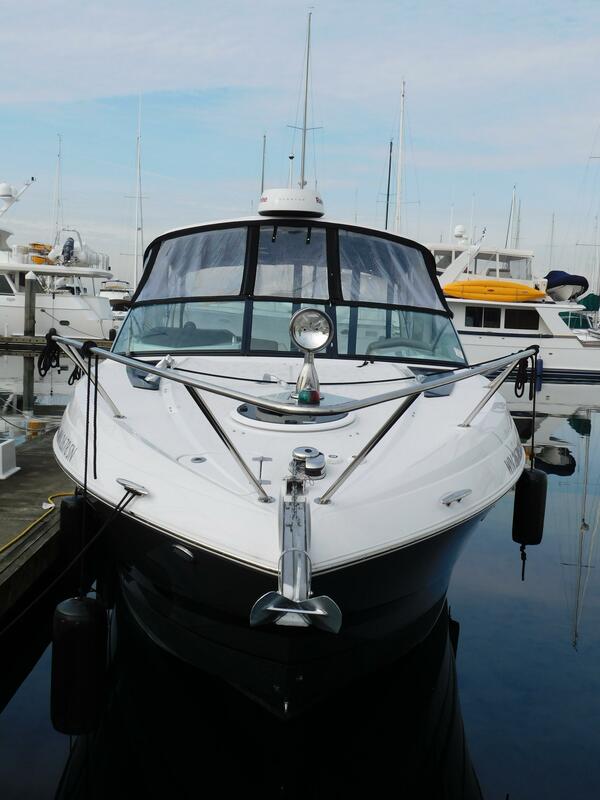 Come in for a look before this boat is gone. It's a great value! 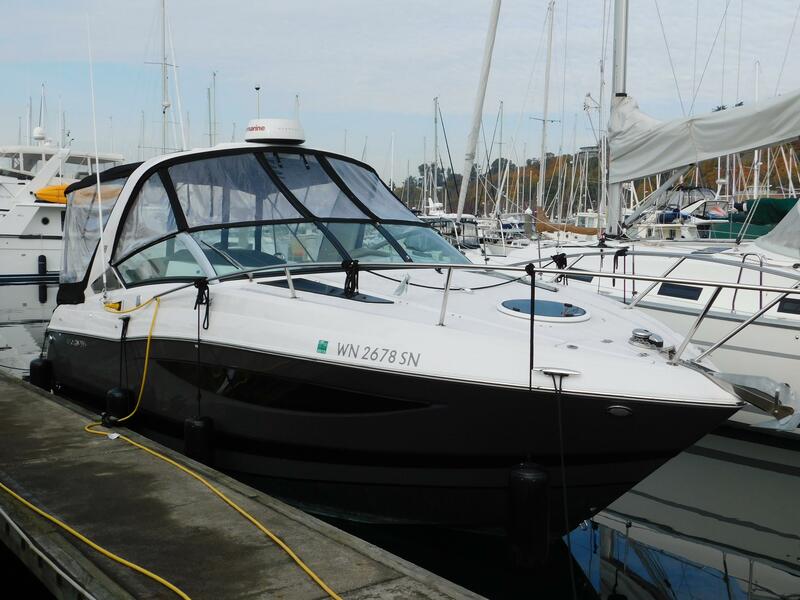 Seattle Yachts provides access to thousands of boats and yachts available on the market today. 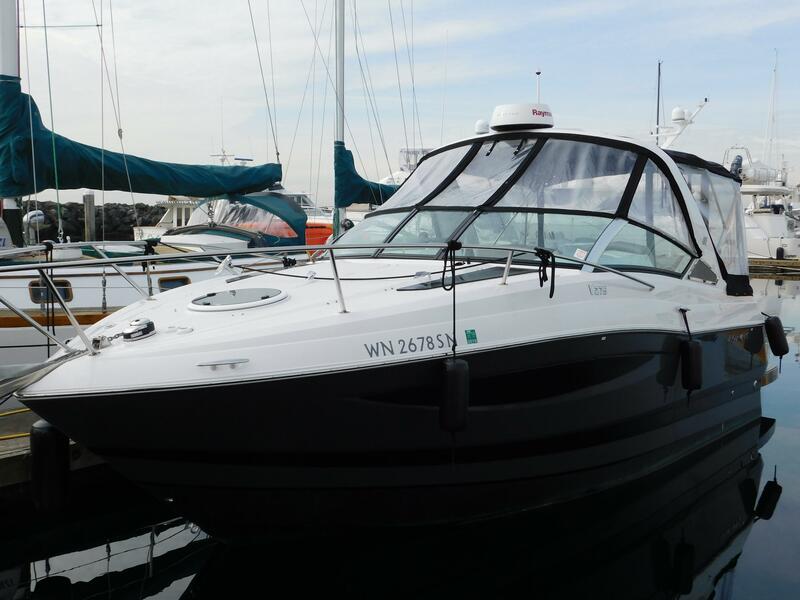 These new and used yachts for sale around the world and on the MLS may or may not be listed with Seattle Yachts, however we have the expert team on staff to help you with the purchase of any brand or type of boat. 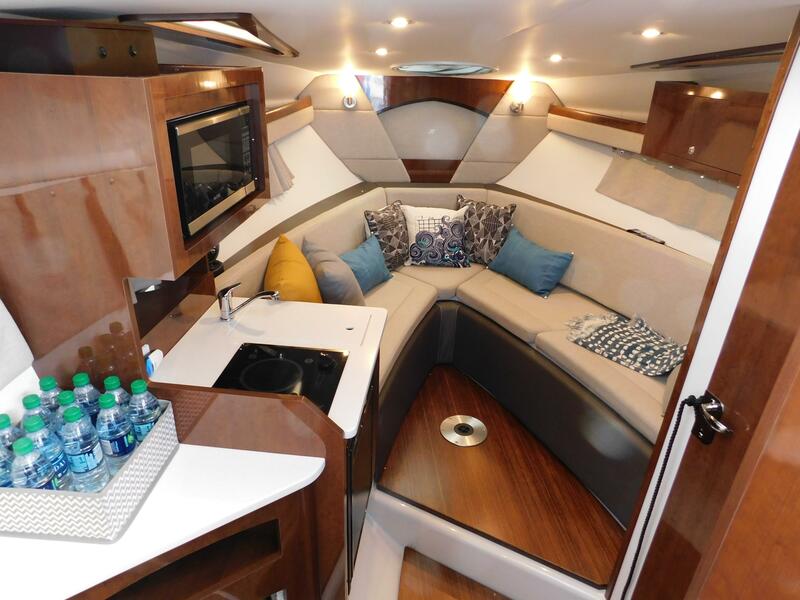 Open single level cockpit for entertaining complete with cockpit galley and dinette. Large swim platform with swim/dive ladder. 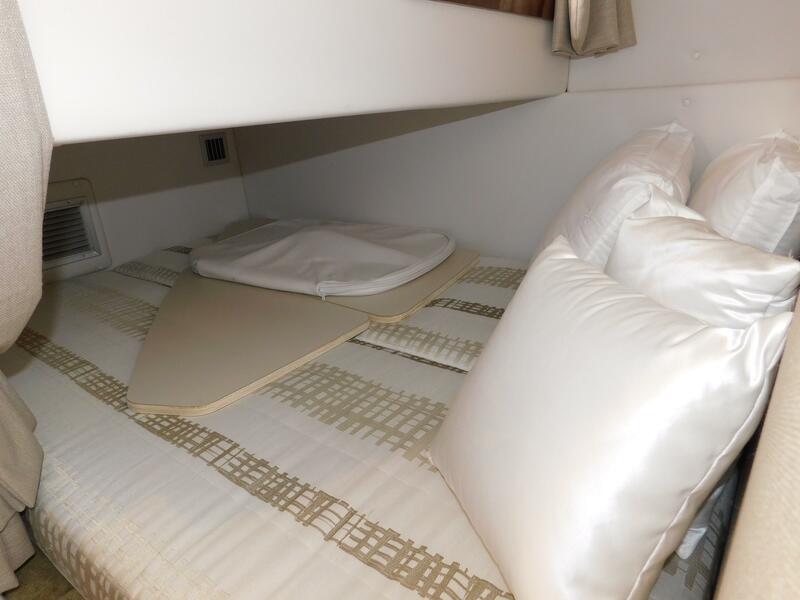 Two cabin layout below with galley including microwave, head/shower, convertible dinette/birth forward and mid cabin double birth. Very nice fit and finish that is warm and inviting. 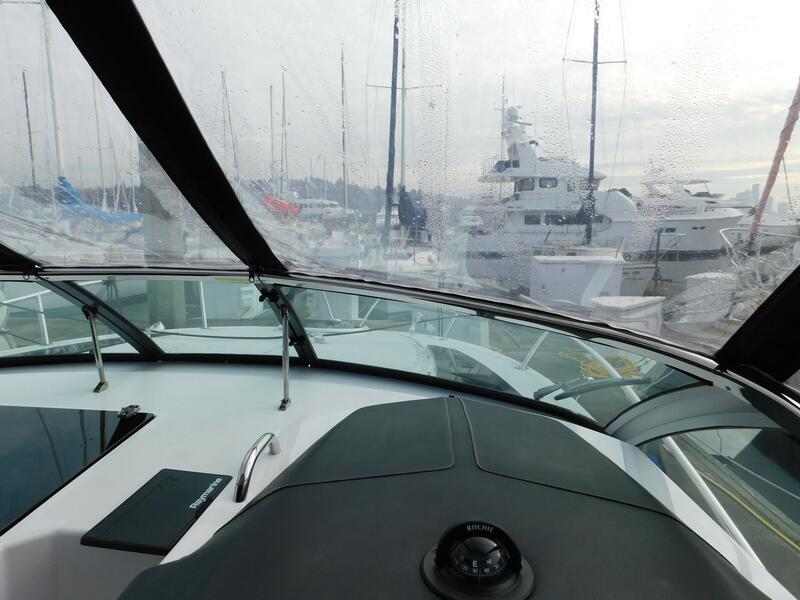 Double helm seat with great visibility and easy to reach controls. Adjacent to helm on port side is a large settee. 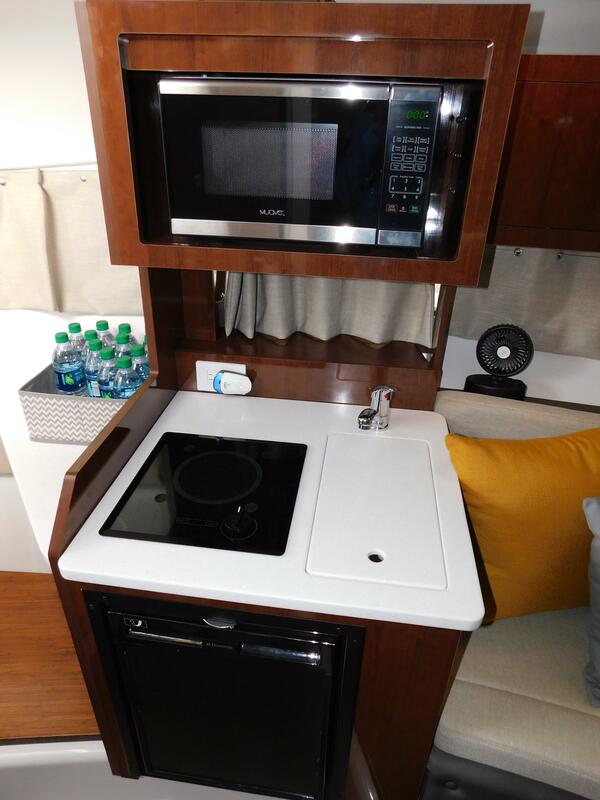 Aft of settee is a Corian counter top galley with BBQ, sink and under counter is a refrigerator and storage. 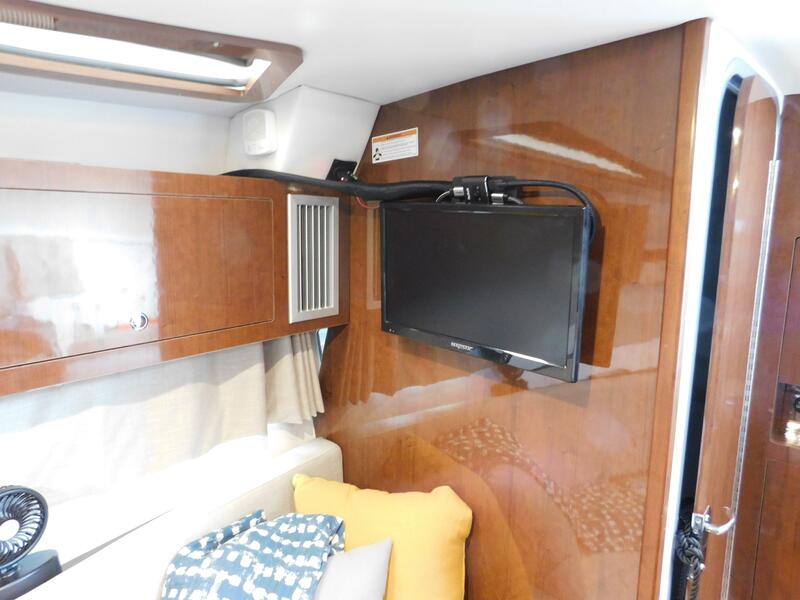 There is also a 12v outlet with TV coax connection for watching movies or the big game! 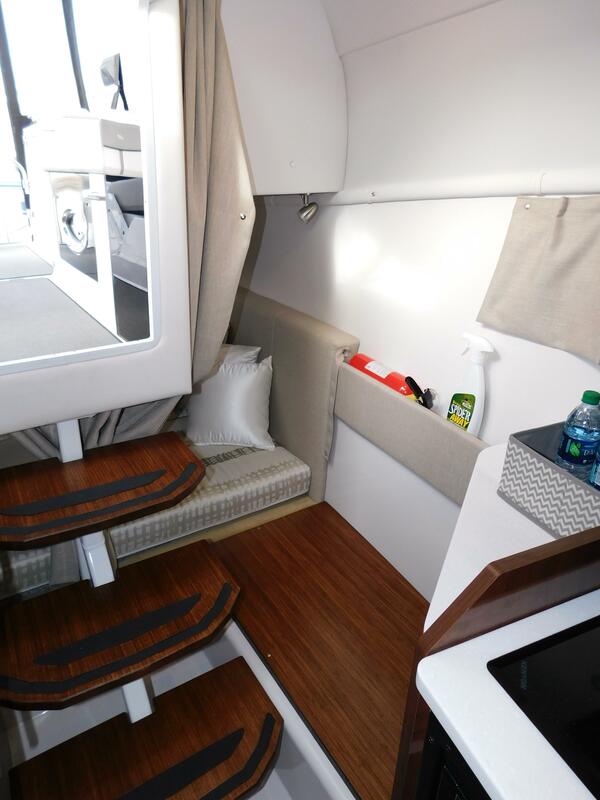 Adjacent to the cockpit galley is a large dinette and the aft bench seat back flips over to a aft facing seat to the large swim platform. Aft swim platform in mat - grey teak pattern is very large and has a built in swim/dive ladder. Cockpit has durable reed mat in ash. Dark Cherry Gloss Cabinetry & Accents. Large dinette forward that converters into large double birth. Led lighting throughout. 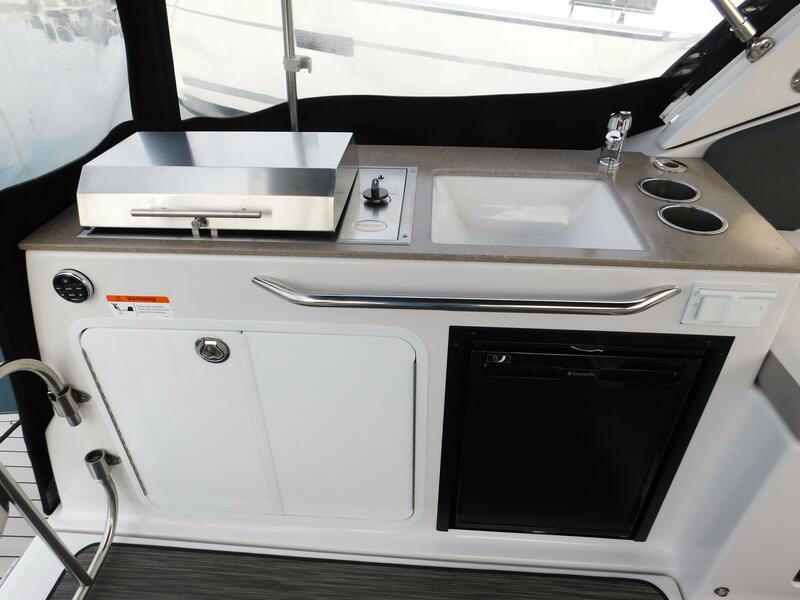 Aft of the dinette port side you will find a galley with stove top, microwave sink and counter space for food prep. Opposite galley there is a hanging locker and a wall mounted TV. 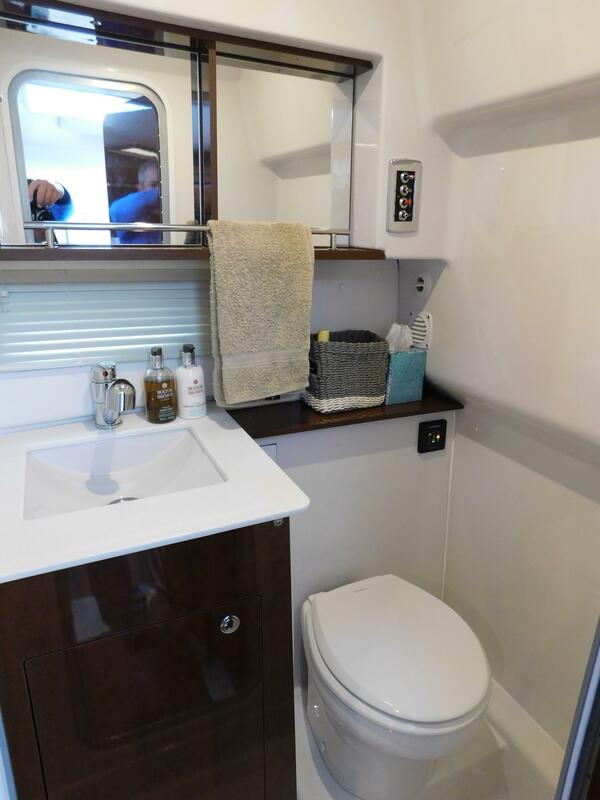 Starboard side of the saloon is a head/shower with electric flush toilet, counter with sink and storage. 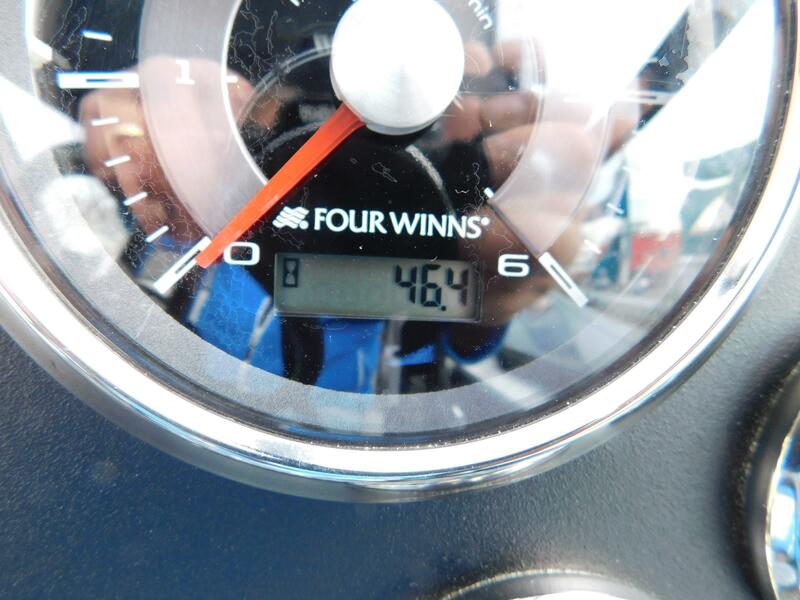 Head has indicator lights of holding tank level. There is a mid cabin with large double birth with LED lighting, ports to let natural lighting in. 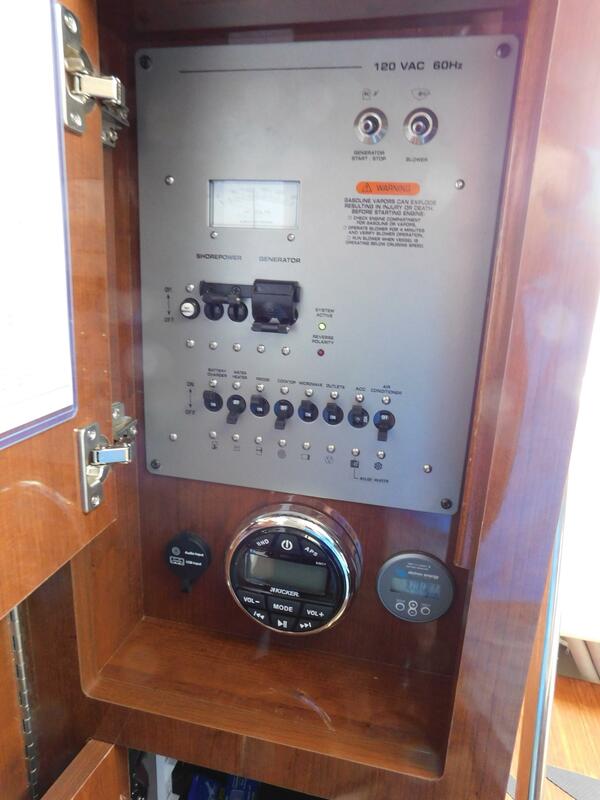 There is a locker on aft bulkhead of the saloon that contains the AC electrical panel, generator controls and stereo. 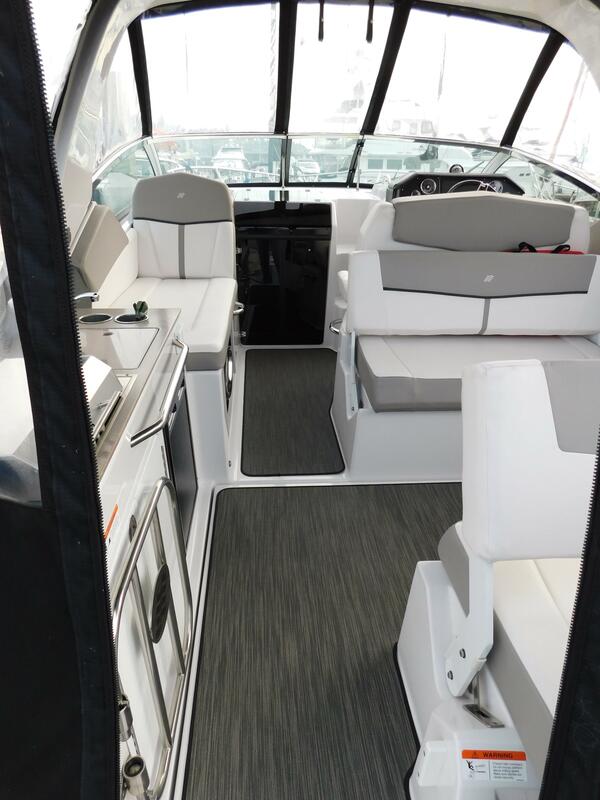 This interior has all the accommodations for cruising in comfort and style. 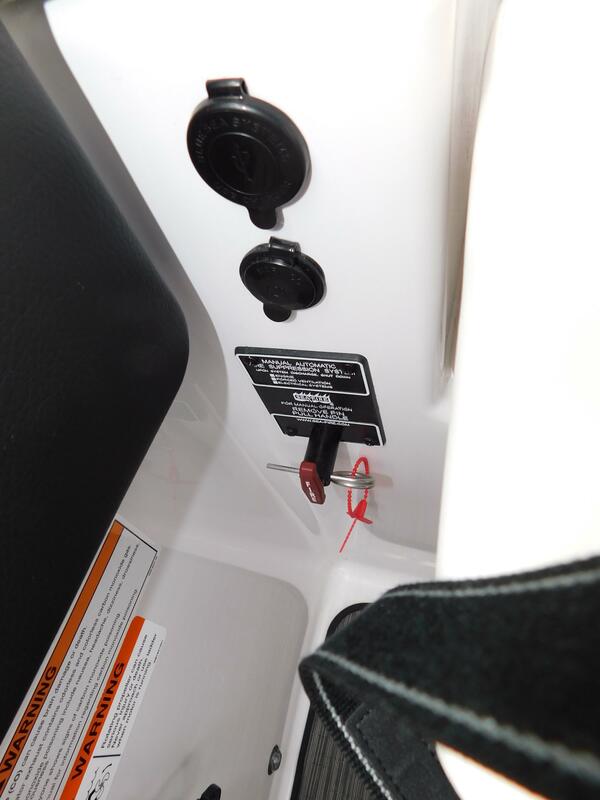 Ample 12v & USB outlets throughout cabin for charging all your portable devises. 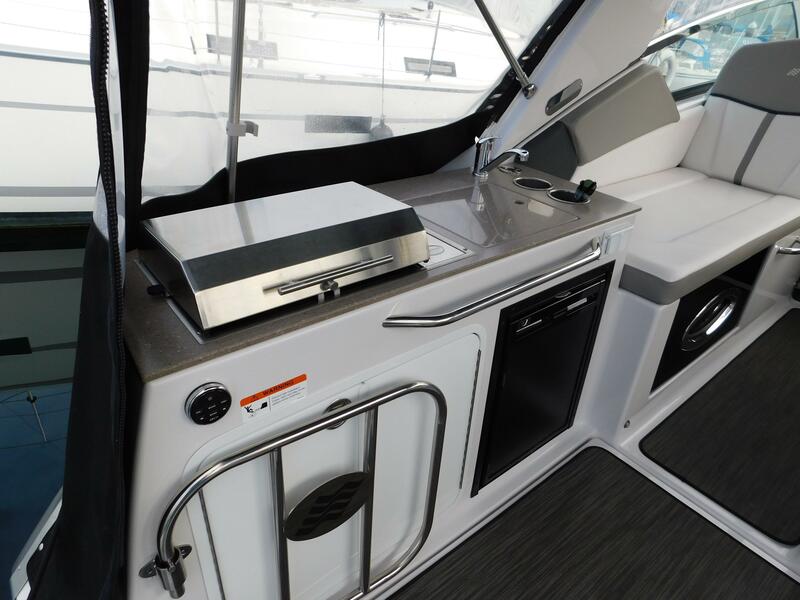 Deep Vee hull provides safe and comfortable ride with a 18 degree deadrise at Transom! 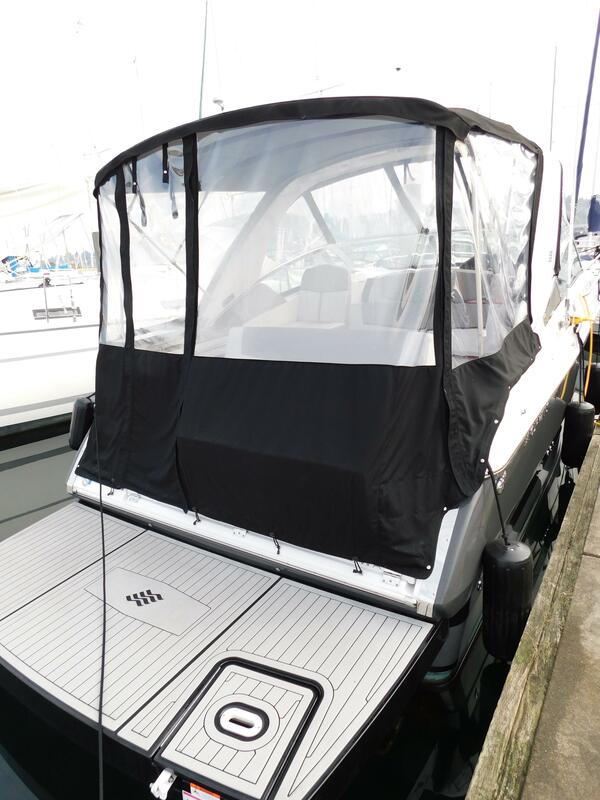 Optional Phantom Grey hull & jet-black assent stripe. 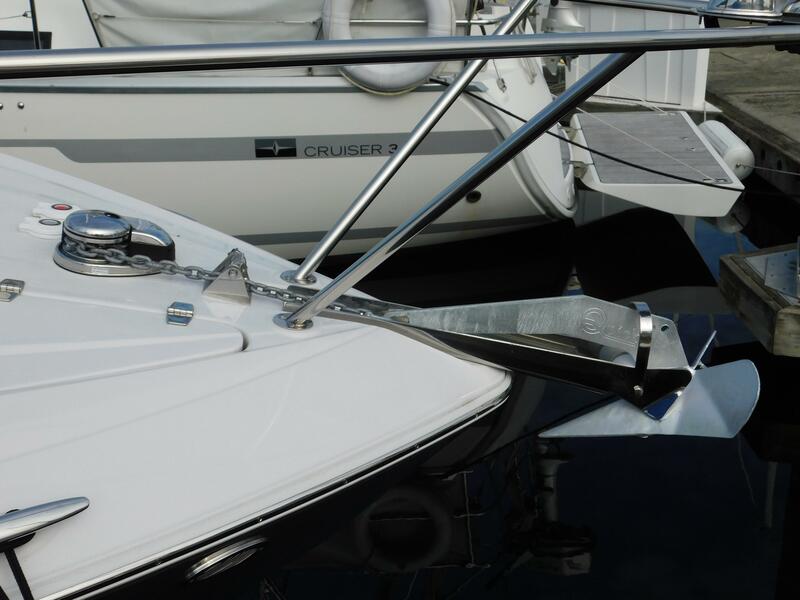 Anchor Locker, Bow Roller and Deck Pipe/ Anchor Chute, Bow Rail - Stainless Steel. Windlass with foot switches. 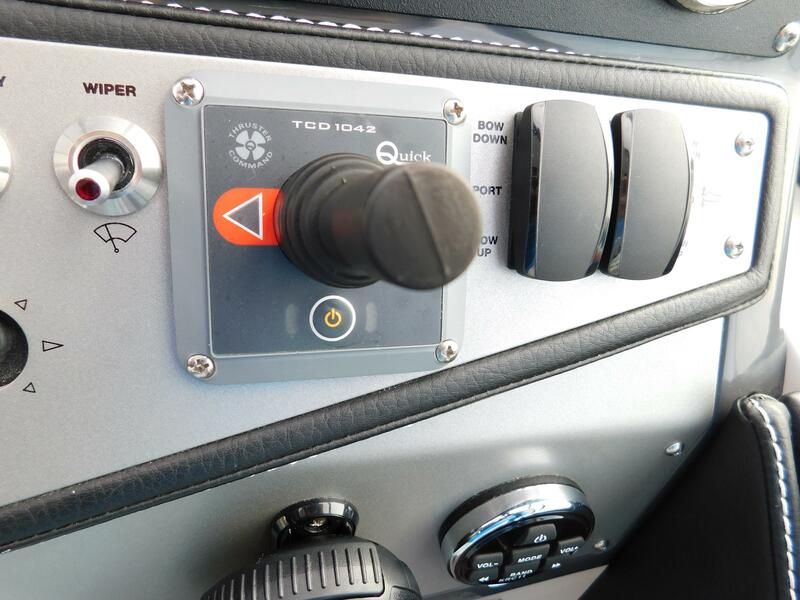 Rub Rail w/HD stainless insert. Fiberglass Stringer system, foam flotation, self-draining cockpit floor. 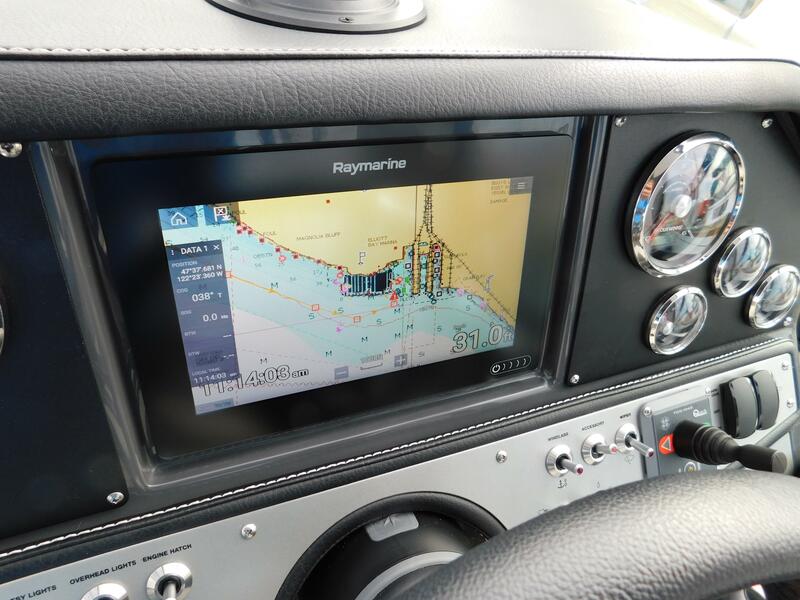 Raymarine Axiom 9" Multi Function Display. Down and side view transducer. 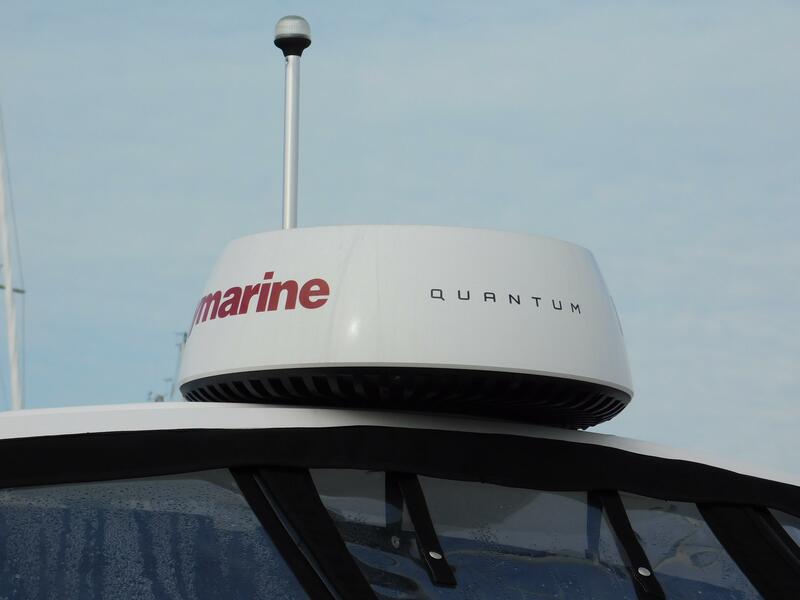 Raymarine Quantum 18" 24mi radar dome. 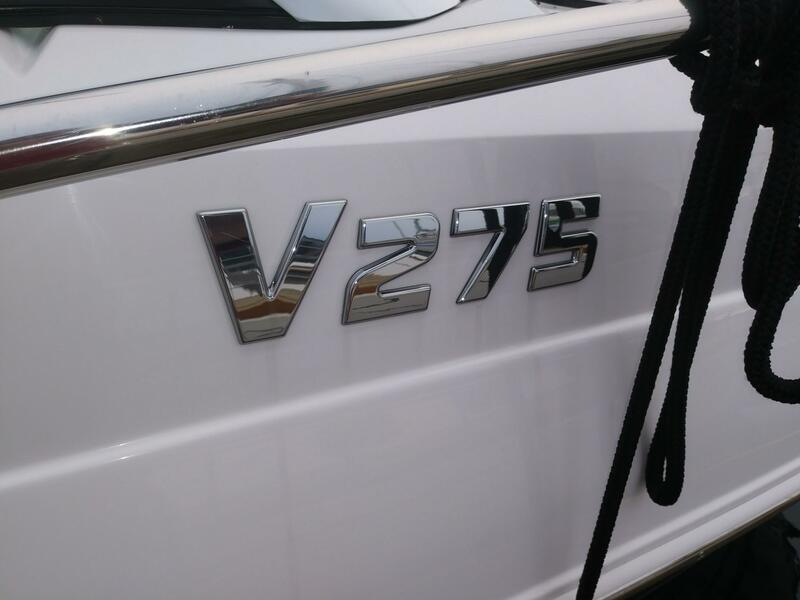 Raymarine Ray 70 fix mount VHF with AIS. 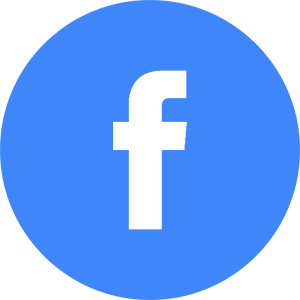 Smartcraft Bluetooth module for Mercury app. 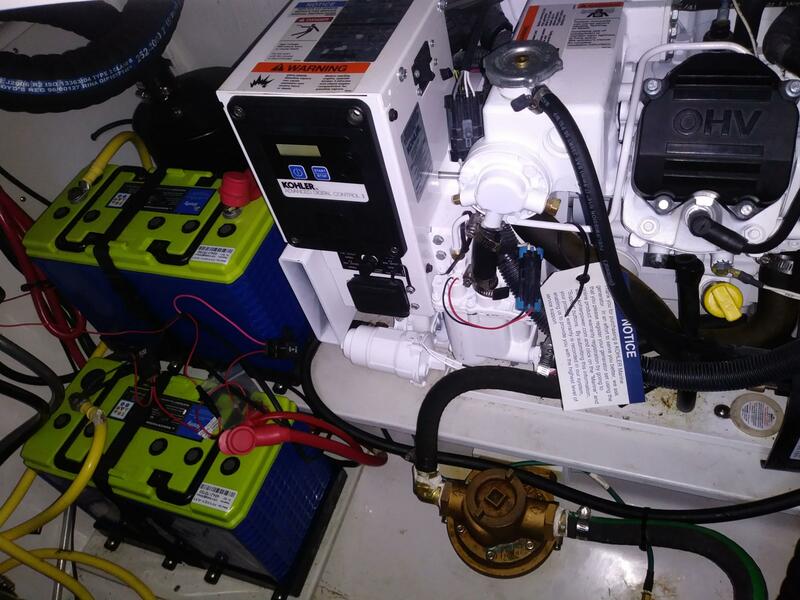 Also connected to NMEA 2000. 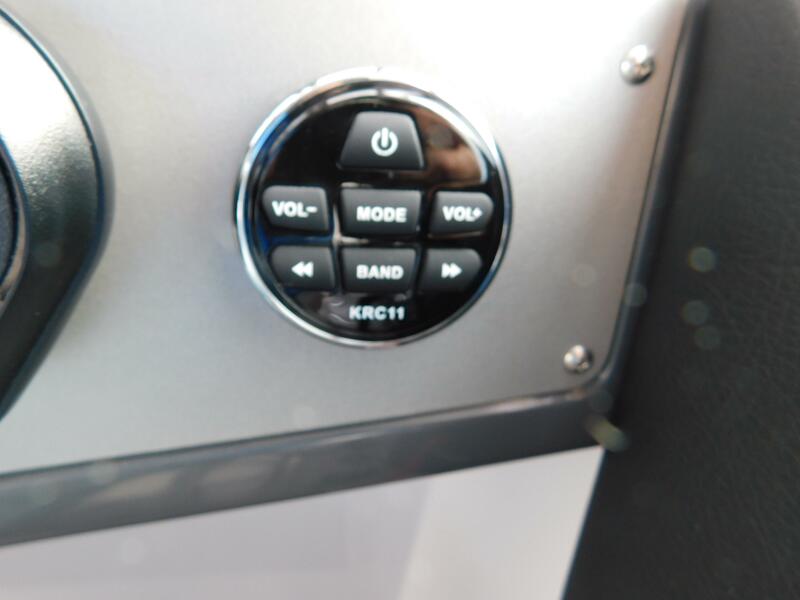 Fusion stereo with remotes throughout including cockpit. 12v LCD TV with DVD player. 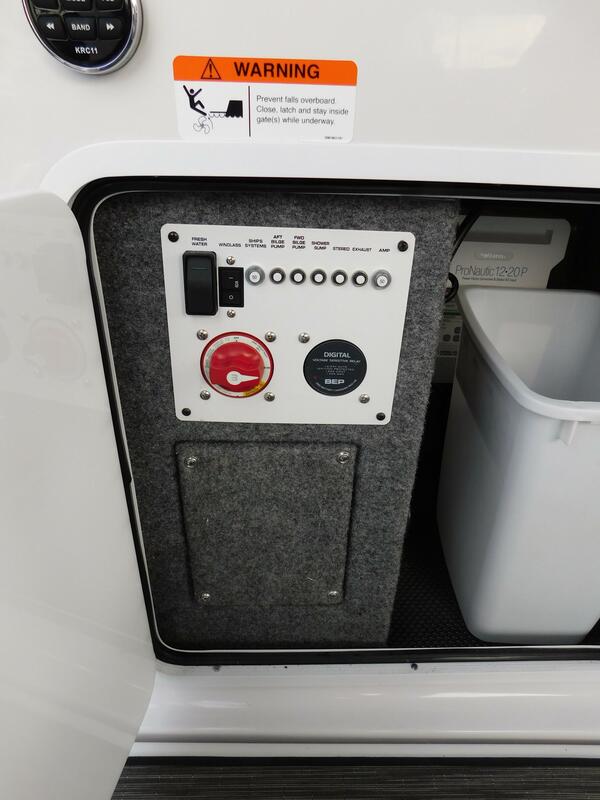 Shore power with AC electrical breaker panel. Upgraded Firefly G31 AGM carbon foam batteries. Victron BMV-712 battery monitor system with Bluetooth capability. Smart multi stage battery charger. 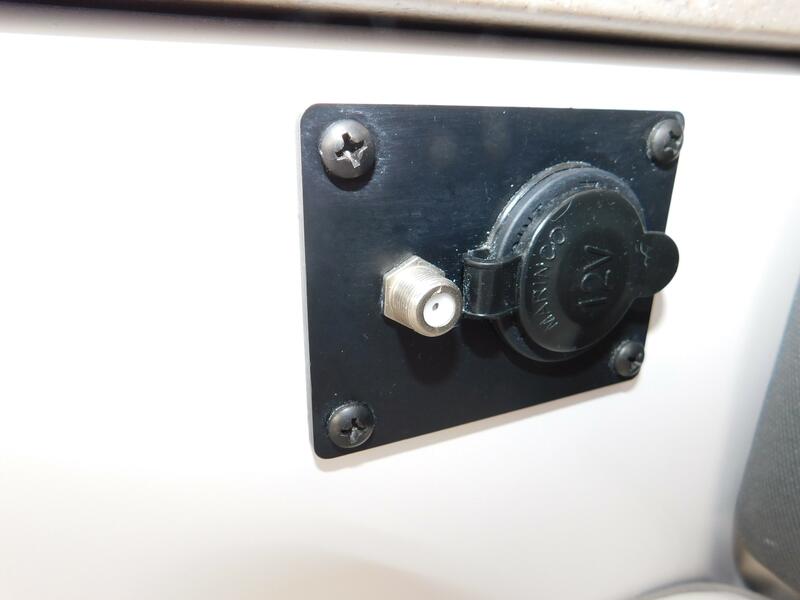 Auto safe engine room heater. DC system with battery switch and DC breaker panel. 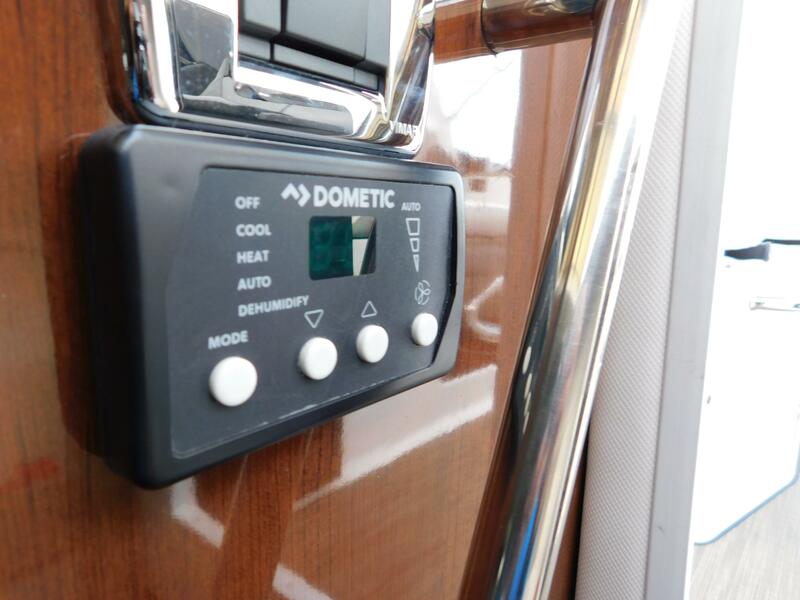 AC outlets throughout the boat. 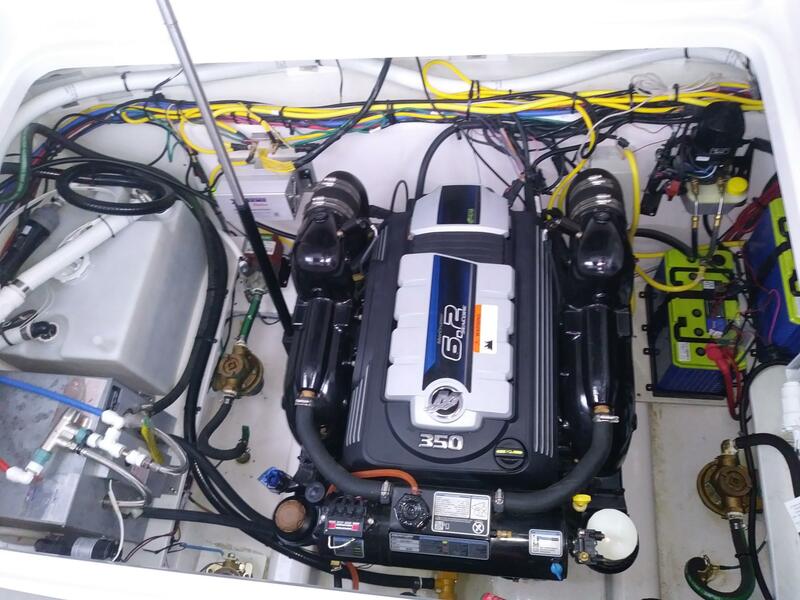 Mercury 6.2L I/O 350hp EC/SC DTS. Mercury Bravo III outdrive with dual prop. Kohler 5kw generator with only 6hrs. 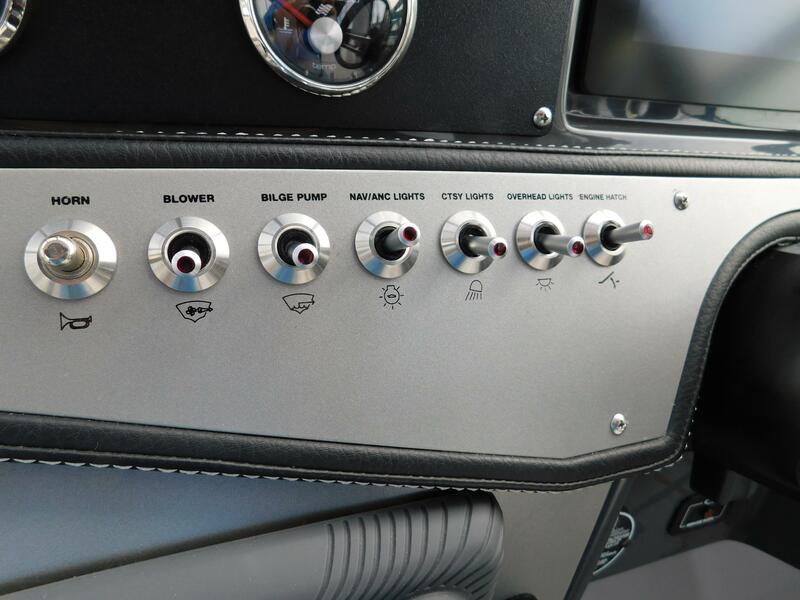 Engine room fire extinguisher system with remote at helm.